I suspect the non drive side cup cannot be tightened fully as it compresses on the bearing? Nope, wrong assumption. Plus there is a recommended level of torque for the bottom bracket - "tightened fully" is not something commonly used in mechanical manuals anyway. 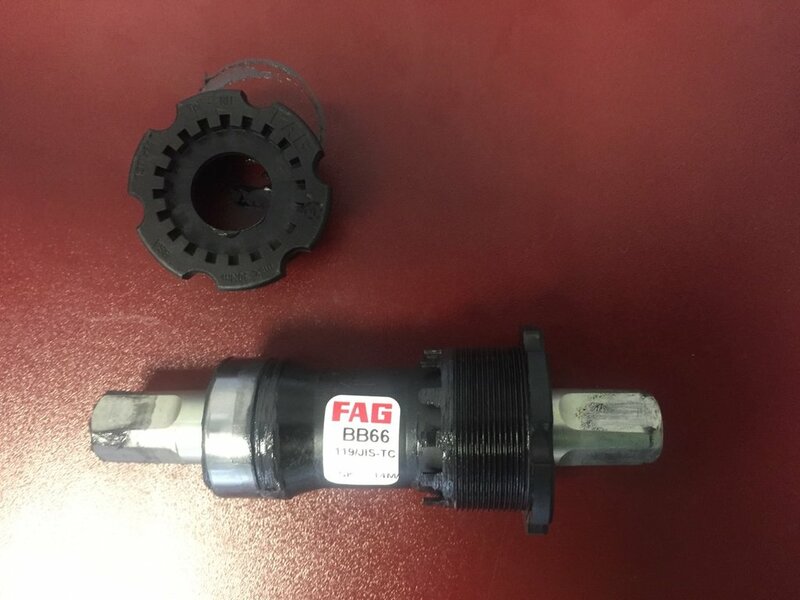 This is what the Brompton's bottom bracket looks like (this is one that got exchanged during the recent recall, the actual ones are a different brand but follow the same principle mechanically). When properly mounted as supposed it will turn freely as long as it is not defective. You may want to get the bike shop to check the BB anyway. I happened to have removed the cranks of my wife's as new B and found the BB to be very stiff, you could hardly turn with your fingers. The serial number was just before the range being recalled, so I decided to replace with a Shimano one. But surprisingly, once out of the frame, it spins fine but not when installed. I suspect the non drive side cup cannot be tightened fully as it compresses on the bearing? Thats the only explanation I can come up with. Anyway, the Shimano one is better quality. Difficulty to turn a mounted BB with fingers grabbing the axle is very normal as fingers cannot deliver much torque. Even a slight push of the cup against the bearing or axle can make rotation with fingers difficult. For pedaling this is completely irrelevant as pedaling legs deliver humongous torque by comparison. One thing about using the plastic, is ... it wont corrode or rust. I finally picked up the bike yesterday! Will post photos soon... The black lacquer looks amazing in the sun. Almost takes on an olive hue. Works very well with the black edition components. And the saddle is much nicer than I anticipated so I'll just leave that on for now. I can't wait to see pics. I have no need for a Brompton at the moment, but I might buy one of these anyway! Oh, that IS pretty! I didn't realize the black lacquer was like raw lacquer with black tones, I thought it was more like an opaque paint. That is just lovely. Last edited by Joe Remi; 03-23-18 at 01:40 PM. Ha! Thanks! It's like understated bling! If Bruce Wayne rode a B that would be it. Sweet! Update: Loving the bike so far... Glad I didn't go titanium. You don't feel the weight at all while riding around. I didn't realize the new handlebar grips are so nice. Was thinking I'd swap them out but there is no need. The old Brommie grips were horrible IMO. Also glad I didn't spend the extra bucks on a new headset or bottom bracket. Bike runs just fine without these. And the Schwalbe Marathons actually roll better than expected. Might upgrade to Kojacks later but puncture protection trumps speed on a bike like this... and the 6 speeds are essential for the terrain near me. Love this thing! Curious, where did you purchase your Brommie from? Did you order it online? Good on you for buying the one you really wanted, it sounds like it worked out great! Last edited by Joe Remi; 04-05-18 at 05:17 PM. FWIW on my pakiT, I found the Kojaks actually MORE flat resistant than marathons. Why? Because it seems the kojaks just roll over glass and junk on the road; the marathons get the same crud caught in the tred and then in can work into the tire and tube. The kojaks don't pick up anything =). This is very unusual - my experience is the opposite and I'd assume the one of most other people, too. Consider yourself happy and never change those tires! Honestly I expected to hate the kojaks. I was sure I'd hate flats up the wazoo. None. zip. Now i've cursed myself of course. But with the Marathons I used to spend time after every ride picking crap out of the treads, glass bits, metal bits, whatever. All of my flats were from stuff that had worked through the rubber down into the tube over time - not one blow out, just slow to moderate leakers. The stuff doesn't stick to the kojaks so it's either a blow out or no flats. Now that I've jinxed myself, we'll see what happens, lol.